You have three options for packing up. John’s Moms work with students to organize and pack their belongings. This option is perfect for students who just have too much going on and need some extra help. Parents love the service, too, since it takes the stress out of the relationship and frees them to simply celebrate successes and enjoy reconnecting at the end of the term. Students pack their clothing, bedding, and desk items themselves but leave the large, awkward, and fragile pieces to JPS. This is the most popular option. When we do the packing, items are insured against loss and damage. You do not need to use our boxes or packing services to ship and store with JPS. However, fragile items can only be insured for loss, not damage, if you do not have original boxes with styrofoam inserts. 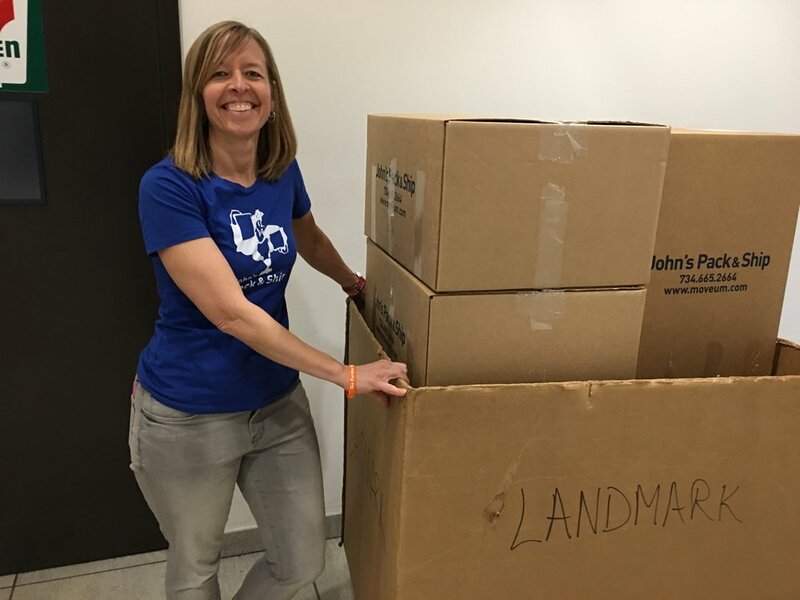 Yes, you can hire one of “John’s Moms” to work with you and help you organize and pack up your belongings. You or a trusted representative must be there to work with the mom. If you have a special situation, please call our office: 734.665.2664. You should box everything that you can, but large, non-fragile items such as bikes, mattresses, futons, rolling drawers, plastic totes, shelves and refrigerators do not need to be boxed. Please note that if your belongings are not covered, you may see minor cosmetic damage upon delivery. Insurance covers the content and functionality of a container, but not its appearance. Note that we should professionally pack fragile items in order to insure them (see below). Drawers with rollers should have their wheels removed if possible and stored in one of the drawers. We will shrink wrap or tape the drawers shut. Plastic containers can be grouped together in bundles so that they are approximately the size of a large box (18x18x24”) and thus charged the standard storage fee ($40). We use our own discretion in taping multiple containers together to reduce your cost. The most economical way to pack mattress toppers, fans, lamps, etc. is to use one of our large boxes and leave the top open. (You can put several tall items in the same box if they are lightweight and narrow.) Obviously the items will stick out from the top of the box. When we receive it, we cap it with a second large box. As long as this box weighs less than 50 pounds, we will store it as an “oversized” box ($55). We transport electronics and other fragile items to our store for packaging. Please do not attempt to pack fragile items yourself unless you have all the original packaging materials with the styrofoam inserts–especially TVs. When you pack fragile items yourself, they are not insured against damage, only loss.